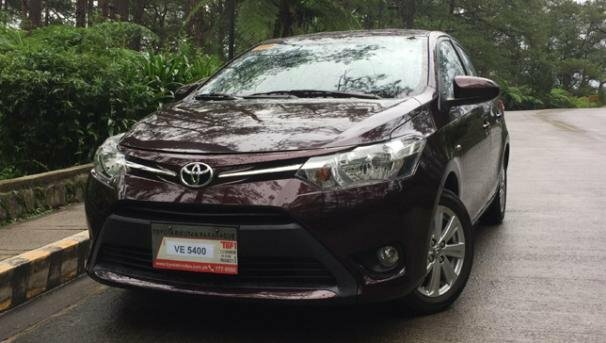 Find the latest price, specs, interior, exterior, pros & cons in our full-scale review for the Toyota Vios 2018 Philippines. 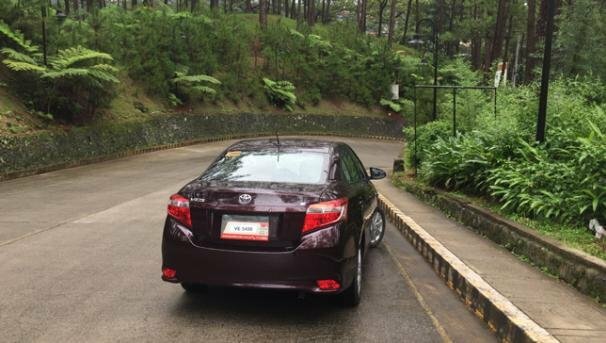 Update: Latest review for the Toyota Vios 2019 Philippines is out now on Philkotse.com! Check out now! 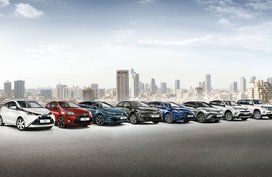 Making its first footprint in the auto market in 2002 when car enthusiasts were expecting a far-reaching change in the sedan segment, the Toyota Vios immediately became the center of attention. The Vios was born as a replacement of the Toyota Tercel and successfully brought up sales numbers of the Japanese car giant. Since then, as its name evokes – “Move Forward”, the Toyota Vios has been one of the best-selling models of the auto manufacturer and also a fierce rival in the sedan segment. It might be interesting to notice that the number of Toyota Vios lover has been drastically increased along with the the launch of its 3 most recent generations. This is one of the main reasons encouraging us to find out what makes the Vios become a great hit of Toyota to the local market. 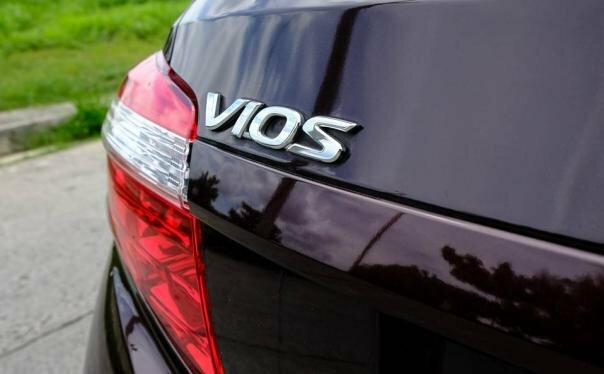 While we are still unsure when the next-gen Vios which was spotted testing in Thailand a few months ago will come to our shores, let's look through our Toyota Vios 2018 review on Philkotse.com for the current generation to gain a full insight into this iconic vehicle. This is a particular review for the Toyota Vios 1.3 E AT variant. Similar to other Toyota cars, the all new Toyota Vios 2018 also received a great thoroughness from its manufacturer. At first glance, the sedan gets a sleek but sporty exterior. In detail, the front fascia features a glossy radiator grille cleverly connected to the front air intakes. 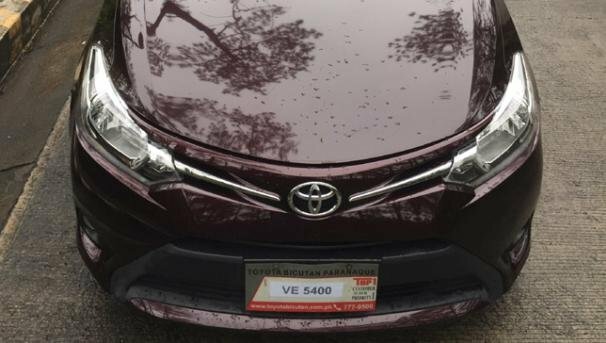 Additionally, the terrifically styled halogen headlights connect closely to the chrome-plated bars, highlighting the Toyota logo at the center of the front. Meanwhile, the bumper is surrounded by black fog lamps, making it more outstanding and delight as well. The sides feature beautiful black B and C pillars, colored door handles and glace indicator mounted wing mirrors. Another refinement of the side is 14-inch/15-inch 8-spoke alloy wheels. The rear is adorned with civilized taillights with wide chrome plate set on the boot lid and a roof equipped with a sporty antenna, keeping a dynamic style for the Vios. The rear bumper has a reflector, along with rear windscreen window and rear combined lamps to enhance safety of drivers and passengers. Although Vios is considered a compact sedan, the overall dimension of the sedan is 4410mm x 1700mm x 1475mm (L x W x H) and its wheelbase hits the 2550 mm mark, which is a pretty impressive figure in comparison with other vehicles in the same segment. 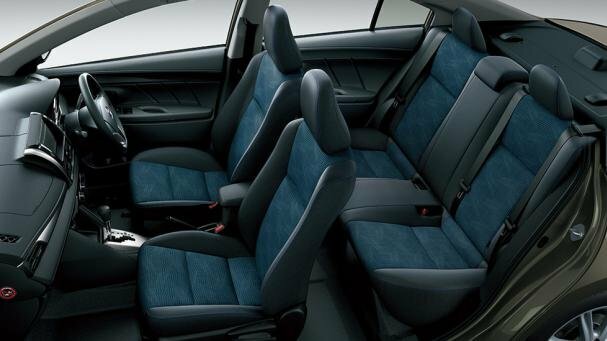 Stepping inside, thanks to a bump in height and length, the Toyota Vios 2018 interior offers a more spacious cabin compared to previous models. The Vios can carry up to 5 people including a driver and 4 passengers. Adjustable driver seat ensures flexible sitting posture, while the rear row is highly appreciated as it can accommodate tall occupants comfortably. However, the seats seem to be more appropriate for urban driving than off-road driving. 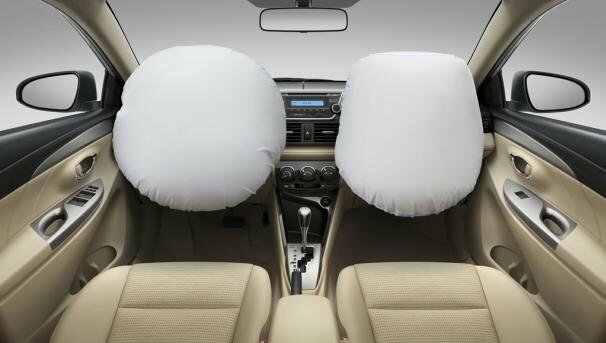 In detail, the Vios seats fail to comfort drivers’ lower back as it provides no lumbar support, which might cause backache during long off-road trips. 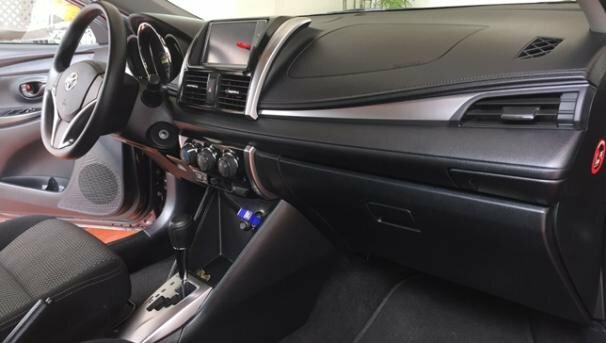 The sporty theme of the Toyota Vios is mostly highlighted in the center console and the dashboard which is wrapped by high-qualified plastic. The dashboard is also impressive with a large tachometer display and an analog speedometer. 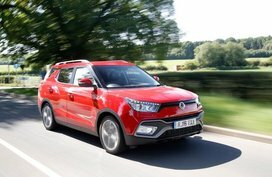 The infotainment system is equipped with a three-spoke steering wheel which is made of polyurethane with an impressively sporty flat bottom and a triple-gauge display. 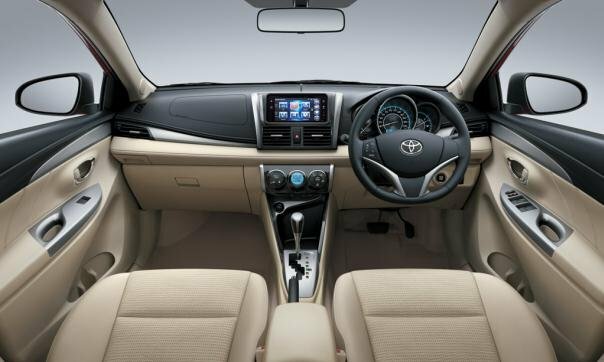 This gauge is decorated with beautifully-designed dials, providing the Vios interior a youthful and sophisticated look. The highlight of the infotainment system lies in the modern audiophiles and a great adjustability for audio centralization, which promises to comfort and relax ears of driver and occupants. 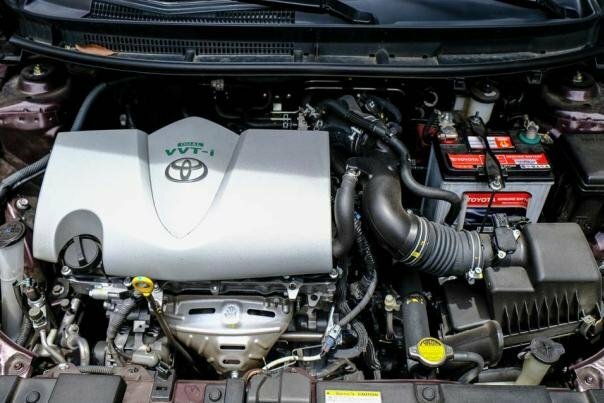 The Toyota Vios 1.3 E AT is powered by a 1.3-liter dual VVTi engine which is capable of cranking out 98 hp and 123 Nm of torque, works in a conjunction with a 7-speed CVT. 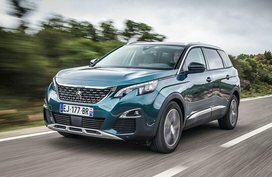 Running with this engine, the car offers better driving experience than expected. However, when running on highways, it is a bit unsure about the Vios’s performance. 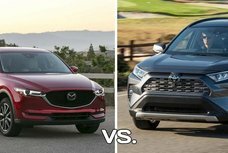 If this is something you concern the most and is considering between Honda City vs Toyota Vios, the former seems to be a more proper choice. Read our review for the Honda City here to have a better comparison. In terms of riding comfort, it is unavoidable that the car causes shaking while running on rough or harsh roads. 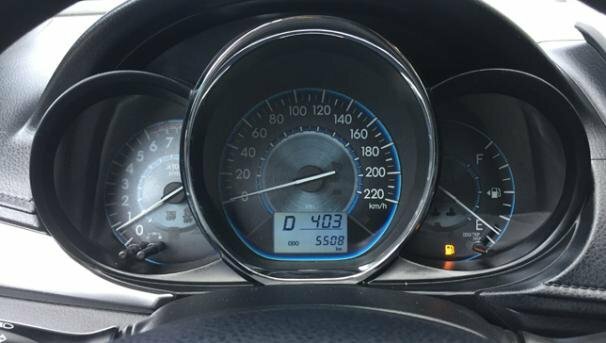 Road noise is another disadvantage for the Vios, even when it runs at low speeds. As mentioned earlier, Toyota Vios is a best-seller of the Japanese carmaker in the local market. 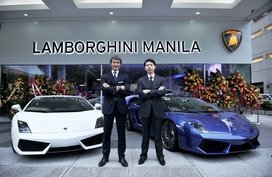 Not only being a popular choice for sedan car buyers, the vehicle is also preferred by those who are looking for affordable cars to be used as a taxi in the Philippines. ₱617,000 is definitely a bargain price for such a great car. It’s time to draw a conclusion. All things considered, it is undoubted that the all new Toyota Vios 2018 is a good choice for car buyers with a spacious cabin, great features and especially, an affordable price tag. Hopefully, our article has added one more reason for you to drive home this famous Toyota vehicle.